I spent years looking at reproductions of Bonnard’s paintings and shrugging. I couldn’t understand what made them work. All the praise was lost on me. Then, only a few years ago, I finally stopped in front of one at MoMA, startled by the immense complexity of its color. Now I get it. Part of what woke me up was the depth of the paint: the intensity of his effort to apply color after color until he achieved something that just wouldn’t sit still as you watched it—and no reproduction even hinted at this shimmering complexity. A couple of days ago, I had an email debate with my cousin about how looking at a painting can be a tactile experience—even if all you’re doing is imagining how it would feel to touch it. Not only is that sense of a painting’s surface an integral part of what it delivers to the viewer, it makes looking at the actual work imperative, because no affordable reproduction can convey surface texture and what it does to color. Photography doesn’t even pretend to offer this sense of physical presence. Films and video are ghostly, a flickering sequence of disembodied shadows at the back of Plato’s cave. Paintings are objects in the world, something that has a physical relationship to your body. He scoffed at all of this, implying that texture and dimension have no significance in a visual medium and that current technology can produce life-sized reproductions that would convey a sense of the painting’s surface—or at least deliver everything that “mattered.” I shot back that maybe he should get out of his house and visit a museum or two, and he sent a long list of major museums around the world he had frequented in his younger days. I gave up. As long as I’ve known him, he’s never been wrong about anything. Like my wife. Anyone who agrees with this kind of certainty about how painting works should check out the show of Braque canvases at Acquavella. It’s a fairly significant assembly of this master’s work, and it has a number of works from the middle of Braque’s career, when his genius reached its peak. If nothing else it will prove that standing a foot away from an actual Braque is a revelatory experience—he created objects, not just images, and they impart a sense of ancient provenance, with stratas of color like layers of sediment in rock. This is partly the result of the way Braque liked to mix sand into his paint, as if he were doing masonry. 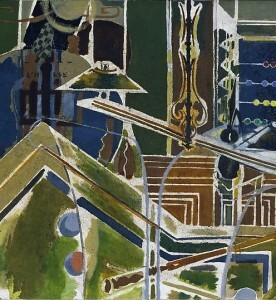 Like Burchfield, in America, Braque attempted to take painting into a region beyond the scope of painting, a territory populated, so far, by only one settler—both artists pushed the art form toward something beyond depiction, submerging themselves in their work to the point where their paintings seem to be offspring of the natural world rather than symbols of it. Braque’s genius was to make his images seem perfectly executed, down to the shape of every line, every color, every texture, when there’s no rational explanation for this sense of perfection. The complexity of his images shouldn’t work: they should seem ridiculously busy and cluttered, and yet they have a sense of invulnerable unity and repose. His work doesn’t mimic the world, but extracts shapes and forms from it to create something that seems both incorporeal and musical and yet as invulnerable and fixed and heavy as the striations in sandstone or granite. Picasso wouldn’t have had a clue how to reach the depths Braque excavated even on one of his off days. There’s no way to recognize this dimension of Braque’s work without seeing the paintings themselves.